Chanteur et chef d'orchestre Western Swing US né le 8 Juin 1916 à Moulton (Texas). Adolph Hofner est décédé le 2 Juin 2000. 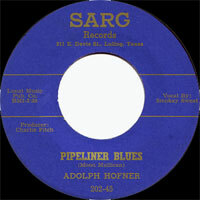 Bandleader and Vocalsist Adolph Hofner was a durable musical icon of south Texas who helped shape Western swing, and whose dual career as a swing bandleader and Czech dance musician showed the ways in which Western swing had roots in Central European dance traditions. Hofner was raised on a farm in Lavaca County, TX, and like many other rural Texans his ethnic background was German and Czech. While growing up, Hofner heard polkas, schottisches, and other forms of local dance music. He and his family moved to San Antonio in 1928, where, four years later, Adolph and his steel guitar-playing brother, Emil, began performing in local clubs. Their sound reflected several strands of the Texas musical mosaic. Adolph was a crooner in the Bing Crosby mold, and Emil, like other early Texas swing musicians, at first emulated Hawaiian sounds -- the brothers' first instrument was a ukulele they ordered from a catalog. 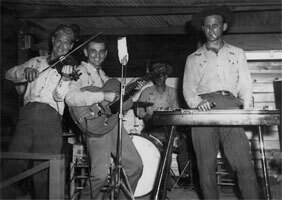 After the brothers heard the pioneering music of Milton Brown and Bob Wills, they began playing the jazz-inflected country dance music that in retrospect was labeled Western swing. 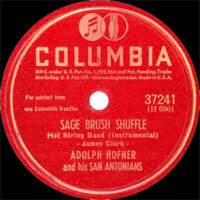 Hofner worked during the day as a mechanic, and at night he performed with various San Antonio bands. 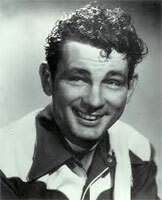 He and Emil joined with Oklahoma-born fiddler Jimmie Revard to form Jimmie Revard's Oklahoma Playboys, a major musical attraction in 1930s San Antonio. 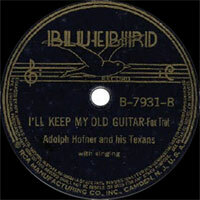 Hofner also cut some sides as a solo Vocalsist and performed on Vocalss with Tom Dickey's Show Boys; his lead Vocalss on that band's cover of his friend Floyd Tillman's melancholy honky tonk success "It Makes No Difference Now" became a hit in its own right and inspired Hofner to form his own band in 1939. 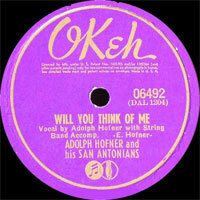 At first the band was known as Adolph Hofner & His Texans, but when they began recording for OKeh and Columbia in the early '40s with the addition of hot fiddler J.R. Chatwell, they were called the San Antonians. Among their best-known tunes were "Maria Elena" and "Alamo Rag." The band spent the early '40s working in southern California; during World War II, Hofner went by the nicknames "Dub" and "Dolph" to avoid the highly unfavorable associations of his given first name. After the war he began using his own name again, and returned to Texas where he also began recording Czech and German polka music in addition to Western swing. 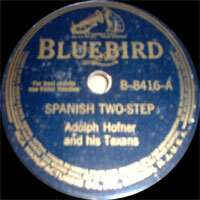 The Czech-language piece known as "The Shiner Song" and "The Prune Waltz" became standards of Texas music. Though Hofner's polka pieces had a distinctive driving backbeat that was clearly swing-influenced, he generally kept the swing and Czech tracks of his musical life separate. In 1949, in honor of new sponsor Pearl Beer, Hofner's band became the Pearl Wranglers for radio, but remained the San Antonians on record. 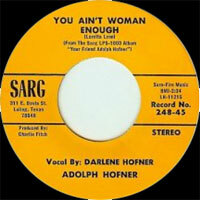 They recorded for the Sarg label for many years and were fixtures of San Antonio music through the 1980s, but Hofner was finally sidelined by ill health and died in the year 2000. He left behind a musical legacy that was richly American in its diversity and a trail of influence that stretched from Willie Nelson down to modern alt-country stalwarts Charlie and Bruce Robison. 05/1938 78 t. BLUEBIRD B-7597 (US) . 07/1938 78 t. BLUEBIRD B-7641 (US) . 08/1938 78 t. BLUEBIRD B-7701 (US) . 09/1938 78 t. BLUEBIRD B-7752 (US) . 10/1938 78 t. BLUEBIRD B-7833 (US) . 11/1938 78 t. BLUEBIRD B-7900 (US) . 12/1938 78 t. BLUEBIRD B-7931 (US) . 12/1938 78 t. BLUEBIRD B-7955 (US) . 01/1939 78 t. BLUEBIRD B-7988 (US) . 02/1939 78 t. BLUEBIRD B-8024 (US) . 03/1939 78 t. BLUEBIRD B-8071 (US) . 03/1940 78 t. BLUEBIRD B-8416 (US) . 04/1940 78 t. BLUEBIRD B-8421 (US) . 06/1940 78 t. BLUEBIRD B-8463 (US) . 07/1940 78 t. BLUEBIRD B-8508 (US) . 02/1941 78 t. BLUEBIRD B-8628 (US) . 04/1941 78 t. OKEH 06139 (US) . 05/1941 78 t. OKEH 06184 (US) . 06/1941 78 t. OKEH 06264 (US) . 08/1941 78 t. OKEH 06350 (US) . 11/1941 78 t. OKEH 06492 (US) . 03/1942 78 t. OKEH 06614 (US) . 03/1947 78 t. COLUMBIA 37241 (US) . 05/1947 78 t. COLUMBIA 37415 (US) . 06/1947 78 t. COLUMBIA 37433 (US) . 07/1947 78 t. COLUMBIA 37656 (US) . 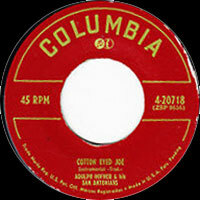 07/1947 78 t. COLUMBIA 37658 (US) . 08/1947 78 t. COLUMBIA 37817 (US) . 1947 78 t. IMPERIAL 1140 (US) . 1947 78 t. IMPERIAL 1141 (US) . 1947 78 t. IMPERIAL 1142 (US) . 1948 78 t. IMPERIAL 1149 (US) . 1948 78 t. IMPERIAL 8010 (US) . 1948 78 t. IMPERIAL 8012 (US) . 1948 78 t. IMPERIAL 8015 (US) . 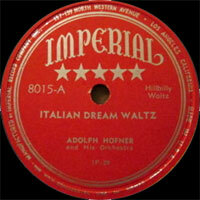 11/1948 78 t. IMPERIAL 8016 (US) . 1949 78 t. IMPERIAL 8020 (US) . 1949 78 t. IMPERIAL 8022 (US) . 1949 78 t. IMPERIAL 8027 (US) . 1949 78 t. IMPERIAL 8028 (US) . 1949 78 t. IMPERIAL 8033 (US) . 1949 78 t. IMPERIAL 8037 (US) . 1949 78 t. IMPERIAL 8041 (US) . 1956 SP SARG 131-45 (US) . 07/1958 SP SARG 152-45 (US) . 05/1959 SP SARG 161-45 (US) . 12/1959 SP SARG 169-45 (US) . 09/1960 SP SARG 183-45 (US) . 12/1961 SP SARG 195-45 (US) . 04/1963 SP SARG 207-45 (US) . 01/1964 SP SARG 212-45 (US) . 05/1964 SP SARG 217-45 (US) . 01/1966 SP SARG 222-45 (US) . 10/1967 SP SARG 227-45 (US) . 04/1968 SP SARG 232-45 (US) . 08/1969 SP SARG 237-45 (US) . 12/1973 SP SARG 248-45 (US) . 08/1975 SP SARG 249-45 (US) . 05/1976 SP SARG 251-45 (US) .